Medical Baggies are qualified to service (but not confined to) Hospitals, Pharmacies & Laboratories. 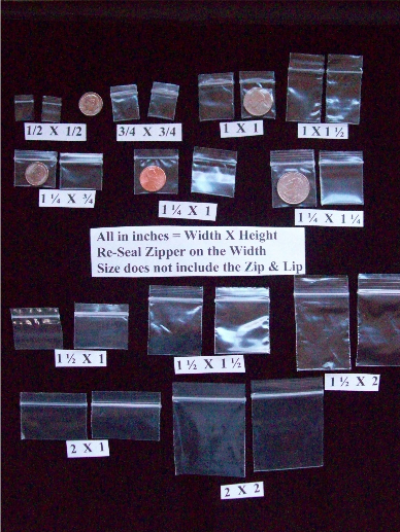 Medical Baggies are "warranted" to conform to "industry recognized standards". Sizes are Width by Height and the measurements do not include the Re-Sealable or lip on top. 2 mils thick. All baggies come pre-packaged in quantities of 100. This Category is the original "APPLE BRAND" and is 2 1/2 Mils ( 2.5 ) THICK. They come in various sizes. All sizes are Width(opening) x Height. This product has the Mfg. Guarantee to “BREAK DOWN” in 18 Months or LESS, in the environment. than our competitions' but 20% heavier and they cost less! High quality Re-Sealable syle bags in various popluar styles and sizes. Baggies, plastic bags, Re-Sealable bags, cellophane bags, biozip bags, drawstring bags, shopping bags, merchandise bags, doorknob bags, leak proof bags and much more! Our baggies are high quality and easy to order. We strive for customer satisfaction - which is why our customers keep coming back for our plastic bags!